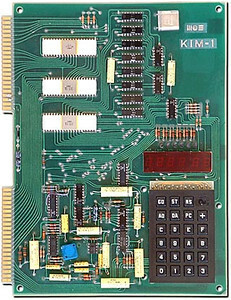 During my education (electronic engineering) we could use the schools' computer (Digital PDP-8), but wow, when this KIM-1 came out, I jumped on it. I could finally play with a 'computer' at home!! Only 1024 BYTES of RAM, hexadecimal 7 segment display and a rudimentary keyboard. It had a 6502 CPU.